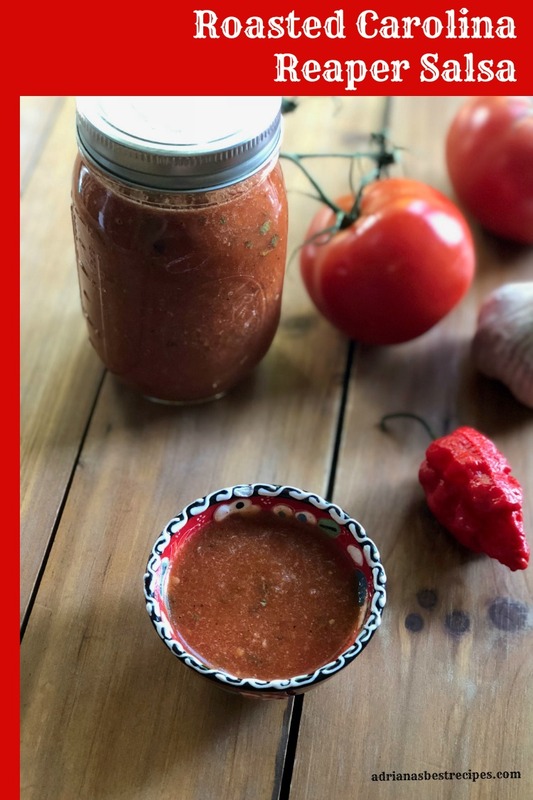 Fiery Roasted Carolina Reaper Salsa, you need to try it! Carolina reapers are considered one of the hottest peppers in the world. Spicier than a ghost pepper and habaneros. However when using it correctly makes delightful salsas that you can enjoy on tacos, chips and almost everything. 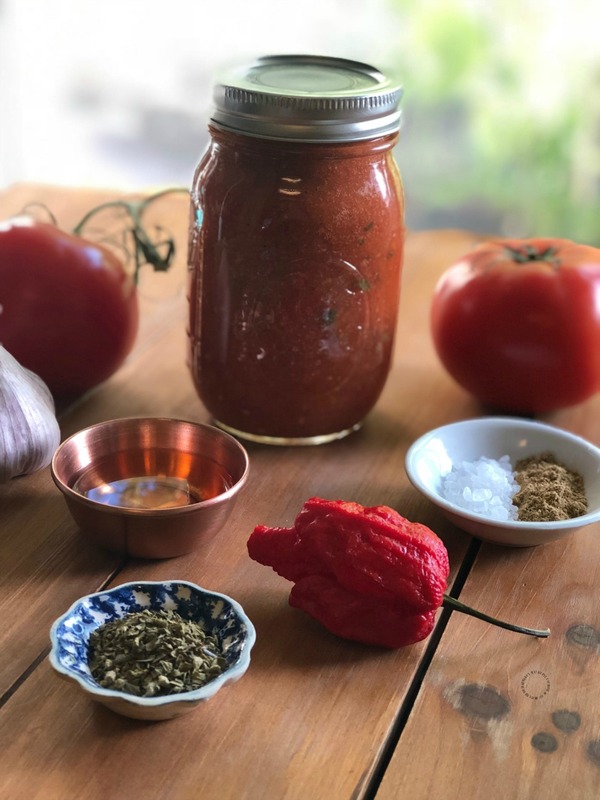 This Roasted Carolina Reaper Salsa recipe has beefsteak tomatoes and garlic. Aside from vinegar oregano, cumin, and sea salt to taste. 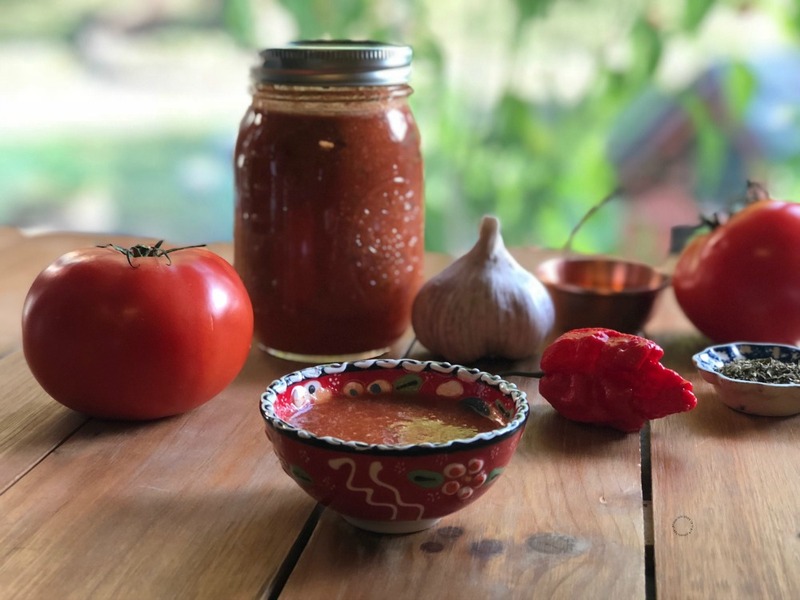 Roasting the Carolina Reaper peppers along with the tomatoes and the garlic provides a pleasant smoky note a characteristic flavor on hot Mexican salsas. 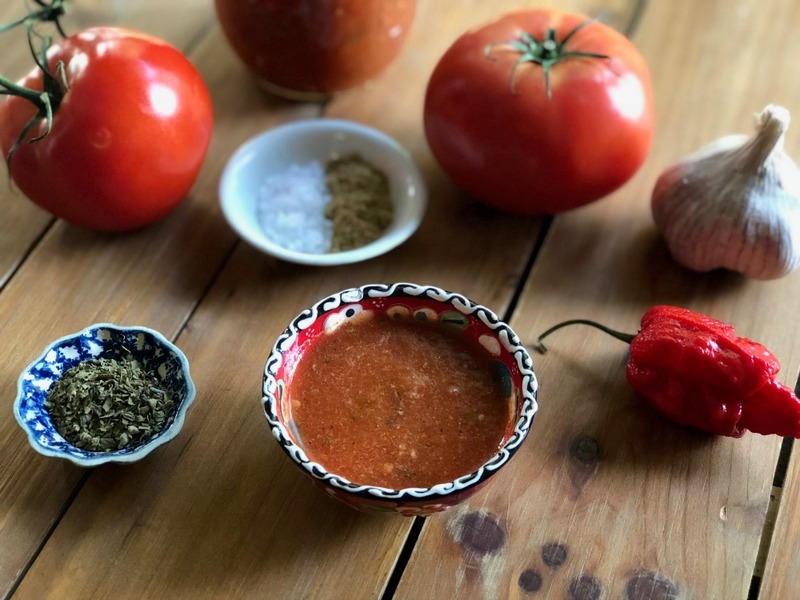 The vinegar is necessary to use in this salsa to give a balance and enough acidity to counteract with the spiciness of the Carolina Reaper peppers. What is a Carolina Reaper Pepper? The Carolina Reaper originally named the HP22B, is a cultivar of the Capsicum chinense plant. The pepper is red and gnarled, with a small pointed tail. The official Guinness World Record heat level is 1,569,300 Scoville Heat Units–that is 100 times hotter than a jalapeño. These peppers can be grown at home and provide harvest year-round. Commercially, you can find fresh Carolina Reaper peppers from June through November only. 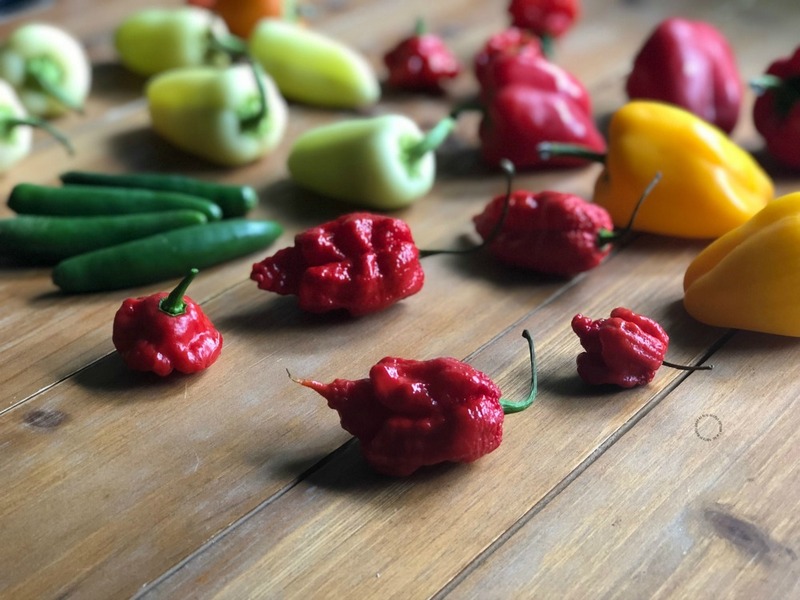 Where to find the Carolina Reapers? In the United States, the Carolina Reaper peppers are cultivated in Rock Hill, South Carolina by “Smokin” Ed Currie, proprietor of the PuckerButt Pepper Company in Fort Mill. You can find them in specialty stores branded with Frieda’s label a specialty produce company or here on Amazon. For the Roasted Carolina Reaper Salsa, we are using half of a Carolina Reaper pepper and removed the seeds and the vein carefully. When handling hot peppers make sure to use gloves and do not touch with your bare hands. Use utensils for cutting and managing. This salsa recipe is perfect for canning and to include in gourmet gift baskets for those that are hot salsa lovers. Nothing like a gift made in your own kitchen right? Make the Roasted Carolina Reaper Salsa and add zing to your food favorites! 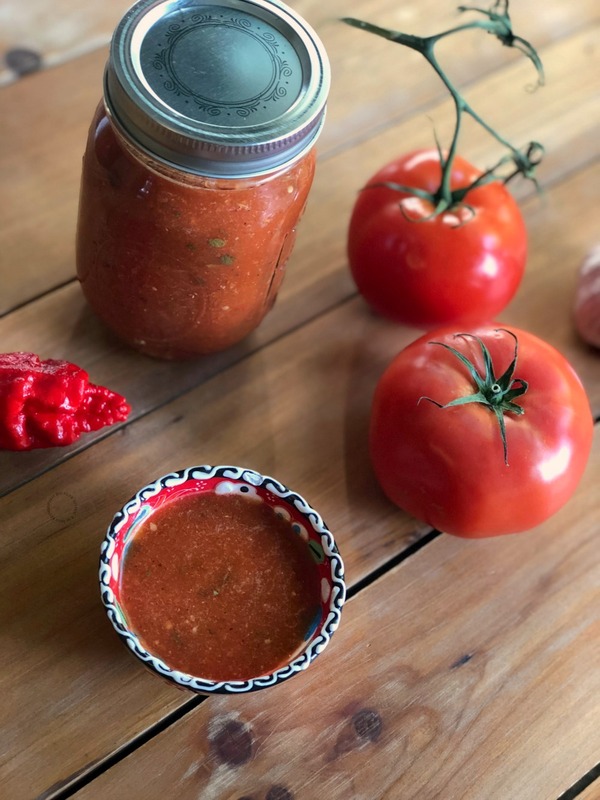 This Roasted Carolina Reaper Salsa recipe has beefsteak tomatoes and garlic. 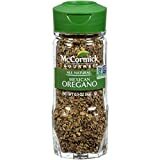 Aside from vinegar oregano, cumin, and sea salt to taste. 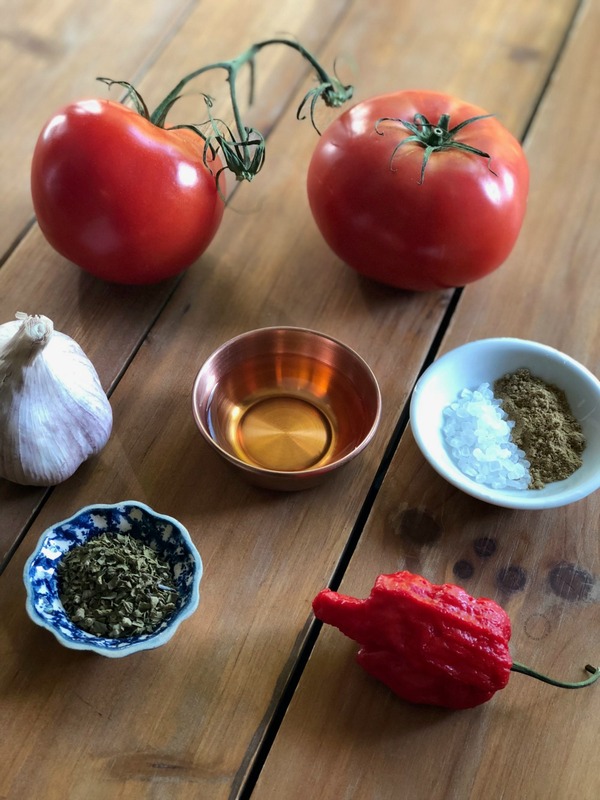 Start by roasting the tomatoes, the garlic cloves, and the Carolina Reaper pepper. The tomatoes will be ready to peel after the roasting process is done. Removing the skin allows for a better-looking salsa. 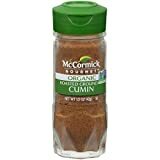 Using a fork and a knife remove the vein and the seeds of Carolina Reaper pepper and use it whole or half depending on how spicy you want the salsa. Add all the ingredients in the blender until salsa has a luscious consistency. Pour salsa to a mason jar and enjoy with all your meals. The Carolina Reaper peppers are considered the hottest pepper in the world. Be mindful on how much you use and use gloves and utensils to handle. Do not use bare hands when handling this pepper. 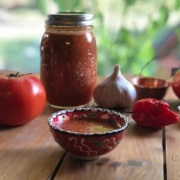 This salsa is perfect for gifting and preserving using the canning technique. This should be a hit with the “heat lovers” like my hubby. I might just a have to make a batch an surprise him. I know he would find all kinds of recipes to use this on. Oh WOW Adriana, this looks hot, hot, hot. I would love to try it, I am definitely not afraid of a little heat in my mouth. Thanks for taming a vegetable that a lot of people would by pass. Interesting recipe! There is nothing better than a super fresh homemade salsa. Your pictures look amazing too! I’ve never seen or tried Carolina reapers, but love hot and spicy food. Would love to make this salsa. Not sure I can find the peppers here in Italy but am going to try! So how hot would this salsa be? I love spicy and hot food so I’m sure I’ll love it, it definitely looks delicious with all the flavorings. I didn’t know anything could be hotter than a ghost pepper. I love homemade salsa and yours looks delish. I really like your recipes as they’re easy to prepare and fully of culture. Fresh is always best when it comes to salsa. I’m dreaming of hot wings made with this sauce in a homemade wing sauce! The perfect light your face on fire sauce. It looks delicious. I love spicy food so much. I like everything hot! But I don’t cook with Carolina reapers that much for some reason. I do need to use the more often. Definitely giving this salsa a try now! Spicy salsa is the best kind of salsa as far as I’m concerned. I need a jar of this in my fridge ASAP. Can’t wait to make it. My tastebuds are proponents for HEAT! The hotter the better, so I know I’m going to love this salsa! Oh wow! This salsa sounds fantastic especially since I like spicy food and am always interested to try a new heat level. This would be perfect for football season too! oh wow – I’m going to have to see if I can source that reaper pepper locally – they look fantastic! I don’t know if I need to try it but my husband definitely does, he loves spicy foods especially salsas. This recipe sound delicious.